Suddenly the fingers of a man's hand began to write on the wall. 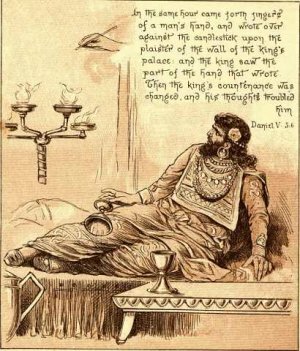 The king became very frightened and his legs began to shake. He called for his wise men to tell him the meaning of the words, but they could not. The queen told him that there was a man in the kingdom who had the Spirit of the Holy God. This man would be able to tell him the meaning of the words. That man's name was Daniel. Daniel did tell him what the words meant. He said, "God is not pleased with you because you have not been humble. You have drunk out of the vessels of the temple, and you have praised idols. You have been weighed in the balances and found wanting. Your kingdom will be divided and you will be killed." Daniel's words came true that very night. 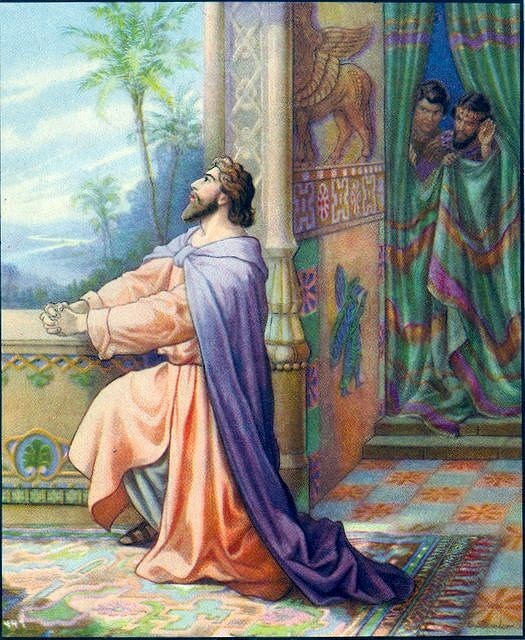 Darius was the the next king, and he liked Daniel very much. There were some bad men in the kingdom who did not like Daniel. They looked for a way to destroy him. They tricked the king into making a law. The law said that no one could pray to anyone but Darius for 30 days. 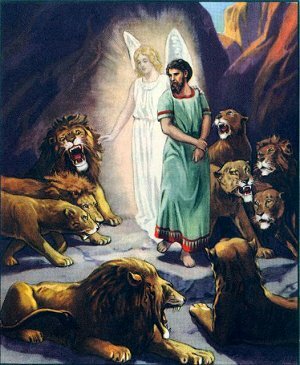 Anyone who prayed to God would be thrown into the lions' den. But Daniel still prayed to God. The bad men told the king. 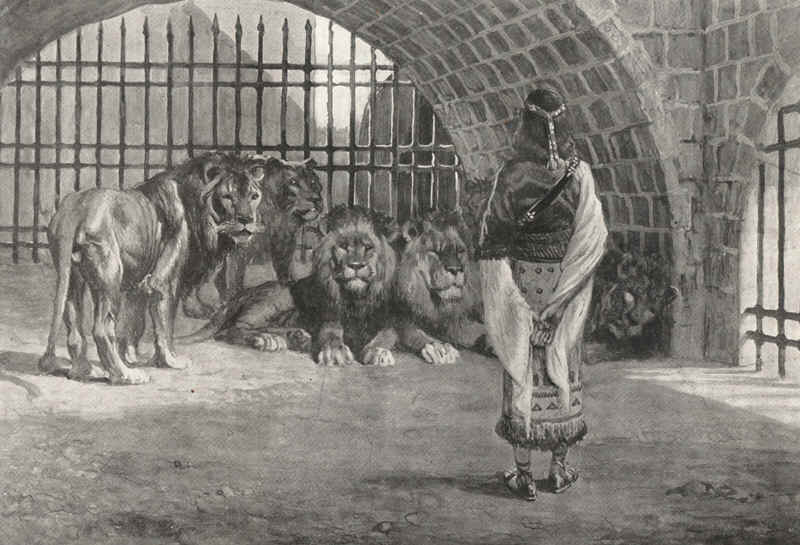 So, the king had to put Daniel in the lions' den. God protected Daniel. The next morning the king found Daniel alive. God had closed the mouths of the lions! Then the happy king and all his people believed in God. Daniel was not afraid to pray in public. And his life was even in danger when he was seen praying. What about you? Do you hesitate to offer a prayer of thanks when you eat in a public place? We set a good example for others when we do have the courage to pray in public. This story about Daniel can be found in the Bible in Daniel chapter 6. English Bible Activities Select story #160 in the list for activities to accompany this Bible story. Spanish Bible Activities Select story #160 in the list for activities to accompany this Bible story. Press "Go" to search for books about Daniel. Thank you for this..It really helps me to find a lesson to be shared to the children on their sunday school service...God speed! I am really gratified for your teachings as a Sunday school teacher for the kids of age 7 years and below "little angels". Am much thankful, be blessed. This page displayed 141,533 times.